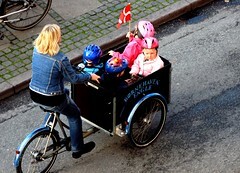 Transporting kids in Copenhagen is an integral part of our bike culture. 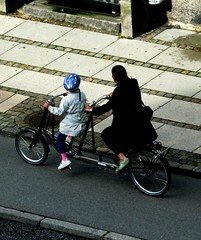 As mentioned previously in this blog 36% of Copenhageners ride their bike each day on average. This figure is bumped up to 50% between spring and summer. That translates into 850,000 bikes on the streets on a lovely summer's day. This fact, coupled with the fact that Danish kids start in daily daycare at the age of 1-1.5 years, means that kids need to be moved around until they're able to ride themselves. Given the sheer numbers of kids being transported it's no surprise that there are a wealth of accessories to assist parents in this task. 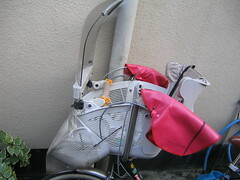 The most popular way is the bike seat. My wife and I both have a set up on our bikes which allows us to just pop the seat off one bike and onto the other, depending on who is picking up or dropping off. We ended up buying a Bobike, one of the most popular brands in Denmark. We love it. That's here above with our son on the back and a baby on the way in the tummy. 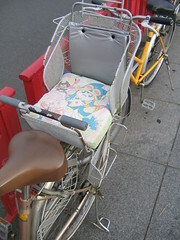 Bike seats often serve the extra purpose of hooks on which to carry your bags. Or, in the case of being a football coach for my son's team as I am, a massive net of footballs sits perfectly on the back. Another popular way to transport kids is getting them up front. I've never had one of these for my son, but wish I did. You can talk to them better than if they're behind you, you're more stabile when riding and, most importantly, they get a better sense of bike riding, something they'll be doing for the rest of their Copenhagen lives. These two photos above are from a trip to Japan. We love everything about the country, including the fact that Toyko is one of the great cycling cities in the world. They have a brilliant bike culture and infrastructure. We saw these two kid transport options there last year. What they may lack in aesthetic design they make up for in practicality. 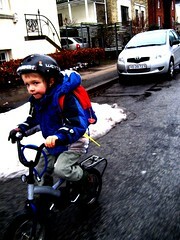 Once your kid is bigger - around 4 or so - they're ready to get riding with you. My son rode next to me on his bike with training wheels from the age of 3.5 - until we ditched the training wheels at age 4 - but the above photo shows another popular option. 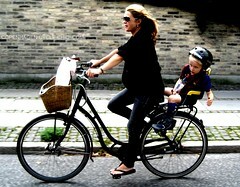 Your kid can pedal if they want and they get the sense of being 'big' by riding solo behind you. They also learn the motion of bike riding, getting them ready for going it alone. We've only ever seen one or two of the above tandem bike, specially designed for kids in front and adults behind. As far as we can tell they're called Compagnon and are designed in Germany. They're definately cool and functional - which is everything northern European design should be. The classic kid transport option is, of course, the cargo bike. 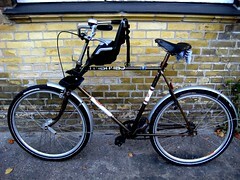 There are many Danish brands - the two above are the famous Christiania Bike. The kids in the first photo are from a kindergarten - they are driven around town during the day to parks, theatre, etc. by the child carers. 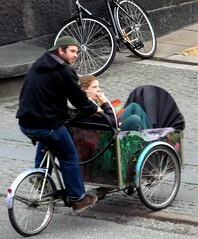 The second photo shows that the cargo bikes are not just for kids. We have a whole post about Danish cargo bike brands here. The goal is, of course, that the kids will learn to ride and become a part of the collective traffic. Like Felix, below, at age 4. Then they've arrived and become true Copenhageners.